CAIRO — The United States on Wednesday accused Iran of supplying Yemen’s Houthi rebels with advanced weapons, including ballistic missiles, echoing allegations made by Saudi Arabia. A White House statement condemned Iran’s actions and voiced U.S. support to Saudi Arabia and other Gulf partners against Tehran’s “blatant” violations of international law. It says missile systems were not present in Yemen before the civil war, alleging that Iran provided them. The statement also urged the United Nations to review evidence that Iran is perpetuating the war in Yemen to further its regional ambitions. Iran supports the Houthis but has denied arming them. The remarks came after Saudi Arabia’s crown prince said that a ballistic missile fired at the kingdom by Yemeni rebels on Saturday was a “direct military aggression by the Iranian regime.” The White House statement did not refer specifically to the missile fired Saturday, which was intercepted near the international airport in the Saudi capital, Riyadh. In response to the Houthis’ missile assault, a Saudi-led coalition announced it has closed all ports in Yemen as of Monday. All humanitarian flights have also been grounded, with trucks stuck at crossings and ships carrying basic necessities like fuel, wheat and other food being ordered to leave. The U.N. warned that the shut-down of the ports could exacerbate an already severe humanitarian crisis, as the war has already brought the country to the brink of famine. “It will aggregate the already dire humanitarian situation,” said George Khoury, the head of the U.N. Office for the Coordination of Humanitarian Affairs in Yemen. He said U.N. agencies operating in Yemen weren’t notified beforehand about the closure of the ports and only heard about it from media. “We want to be crystal clear to the international community, any disruption will have catastrophic consequence on the lives of hundreds of thousands people and children,” he said. Every month, at least seven million people depend on life-saving aid provided by the U.N. Khoury said 10 U.N. ships in the Red Sea ports of Hodeida and nearby Solaf have been ordered to depart. A Saudi-led military coalition has been at war with the Iranian-backed Houthis for more than two years. 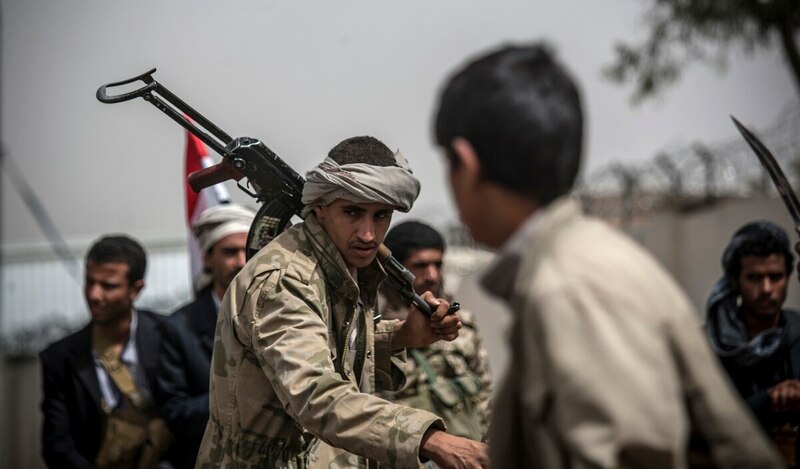 The Houthis control northern Yemen while the internationally recognized government’s grip over the southern region has been weakened. The government is allied with the coalition. Officials, including a top military commander close to Hadi, told The Associated Press that Saudi Arabia has prevented Hadi, his sons, officials and ministers from returning to Yemen. The ban was prompted by the bitter enmity between Hadi and the United Arab Emirates, a key coalition member, they said, speaking on condition of anonymity because of the sensitivity of the subject. The presidency’s statement, quoting an unnamed official, said the reports are a “systematic campaign targeting Saudi Arabia which leads a battle to stop the Iranian interference in Yemen and the region.” The Saudis and the UAE are the main pillars of the coalition.